How long to cut each border strip? formulae? 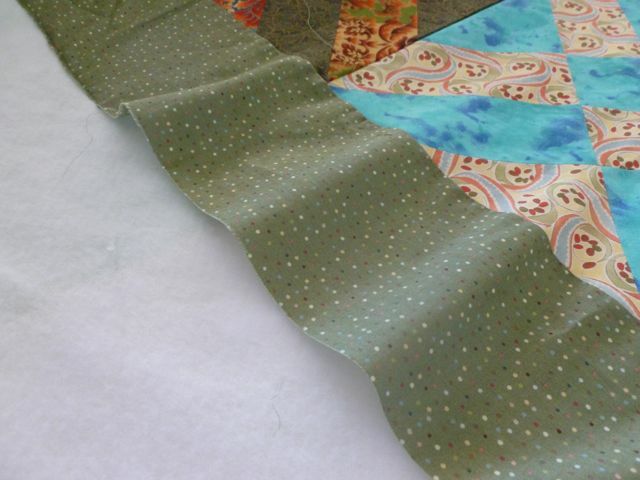 Thread: How long to cut each border strip? formulae? I cannot seem to wrap my head around how long each border strip needs to be cut (sides, top, bottom) with consideration of seam allowances --- especially when designing with multiple borders. To cut the top/bottom border, I take the width of the quilt top x the desired width of the finished border plus .5 for seam allowance. The sides totally confuse me because of the seam allowances. As you can see, I am confused here. Your formula doesn't make sense to me. You said width of quilt top x desired width of finished border plus half an inch for seam allowance. So if your top was 50" and the border was 6", you would ADD, not multiply. Let's say you're going to sew borders onto the sides (east and west) of your top. border + quilt + border = 6 + 50 + 6 = 62". Now, all the plus signs (+) in the above equation are where there are seam allowances. If you're sewing quarter inch seams, that means the seam is taking in half an inch (.25 for the border fabric and .25 for the quilt top, which equals half an inch). There are 2 pluses in the equation, half an inch for each one, for a total of 1 inch. So after sewing on both borders, the finished width of the quilt should be 61". Now you add the borders to the top and bottom (north and south) sides of your top. 6 + 61 + 6 = 73"
Your top & bottom borders should be cut at 73" long. Peggi - recheck your calculations. It's very simple. Measure the length of the quilt (in several places and take the average). This is the length to cut the side borders. Sew them on. Now measure the width of the quilt with those borders included. This is the length to cut the top and bottom border. If you want to cut all the borders before you start sewing, you still measure to get the first measurement. That is the length to cut the side borders. Then add to this 2 times the finished width of the borders and that is the length to cut the top and bottom borders. I do basically as dunster stated. First I measure the length from the center of the quilt top to get my measurement. I sew the long sides first. Then I measure the width from the center of the quilt to get my measurement then I sew my widths. I do add a tad more for wiggle room. Better to have too much than not enough. Just trim the difference. If I want one finished 5 inch border I'll add 1/4 inch to my border strip and cut at 5 1/4. Also, I find my centers of quilt and borders and attach with pins from the center working to the left then from the center working to the right. I was told doing it this way will keep you borders/quilt from being wavy. come out of the width of the fabric......if that is what you think is incorrect. 1st off when measuring how long to cut for your borders, measure from the middle of your quilt as the edges might have gotten stretched and you'll end up with wavy borders if measured from the edges. 2nd most times the sides go on 1st then the top and bottom and again you'll measure from the center of the quilt or at least measure from the center and again on the edges and then average it out. I measure from the center only and normally have issues with wavy borders. I cut each border and attach when I am adding multiple borders unless I'm doing them mitered style, then I might stitch all the borders for each side/top/bottom together and then attach but you have to allow for extra length so you can miter the corners. I rarely miter my borders unless I'm using a striped fabric and want the stripes to meet up correctly. The adding .5 for seams, well if you think about it the outer .25 seam will be encased with the binding so you're really not losing that measurement at all. Just my thought on this subject. also important is to match the middle of the border strip and the middle of that side of the quilt, pin. then pin the ends of border and quilt. i pin a bit in between too. all should lay nice and flat. then sew. Have fun!! This method is the least complicated. But be sure to measure your quilt in several places in the Middle, not at the edges. Average out these measurements and cut both borders the same length as that average. Sew them on. Then do the same with the other sides: measure several places in the middle, including the first borders, average those measurements, and cut both borders the same. I measure using my border fabric. I first fold top exactly in half, lay border fabric on the fold and lightly smooth to the end of top. Then I mark where it should be cut. Lay other border strip under first and lightly smooth to the mark and pin those two ends together, cut on mark of first strip. Sew onto top. For ends I do the same as for sides. Fold top exactly in half and continue to do as I did for the sides/ length. People do things differently to get the same results. There should be youtube videos to show how the "experts" do it. Try a few different ways to see what results you like best. My way works best for me. I have been making quilts since mid 1960s. What's wrong with them, where did I go wrong? The math is correct, so....? The OP was asking for a formula and expressed confusion about the seam allowances. I thought I gave clear explanation of both. Hi, I just wanted to say Welcome to the board and it is really not that difficult. Is this your first quilt? As others have said measure in several places take an average cut your border. Good luck! I'm new at this, so take this with a grain of salt. Faced with the same situation........I measured the length and cut the side borders plenty long, sewed them on, and trimmed them even with the ends. Then I measured the width and cut the top and bottom border plenty long, sewed them on, and trimmed them even. Done! Thank you for explaining exactly where I went wrong, Charlotte, you're absolutely right. I knew I should have drawn a diagram. Jim, this is a common mistake beginners make, so don't feel bad. This is a good way to get wavy, hard-to-quilt, out-of-square borders. The best way to avoid this problem is to do it the way dunster describes - measure, cut, and ease in to fit. also, I just read that if you cut the borders lengthwise instead of widthwise, there is less chance of getting waves. I had done this years ago but don't remember how it worked out for me. I have even cut the lengthwise borders before cutting up the rest of the fabric so that I can get the full length of the border in one piece. Thanks for your input but I'm not quite getting it (not unusual). To further explain what I did. I cut my side border extra long and pinned it to the side, starting in the center and I wonder clipped in both directions. As I sewed the border on, if I started to get any bunching, I just readjusted the clips. Once done I just trimmed the ends even with the top and bottom. Didn't seem to get any bunching. My top was 1/8" out of square (taking diagonal measurements) before adding the trim and still 1/8" out of square when the trim was added. I'm not sure what tolerances I should be trying to work to. Lots to learn. I used to do borders ( which is a process I intensely dislike) the way you are doing them. Sometimes it worked well but often I had wavy borders that were difficult to quilt. I didn’t know why sometimes it worked and sometimes it didn’t so I consulted the interwebs and came across this tutorial . It really helped . No more wavy borders. I have done it about all the ways mentioned and for the majority of the time I do it like the Spruce Crafts lady. In all of the quilts I have made, one had wavy boarders. It seems the more borders the bigger chance of waves for me. I do try to cut the length of fabric instead of the width. Ah.....ha! I got it! That article helped that little light bulb in my head go off, so all of the other input here now makes sense to me. As a lifetime amateur woodworker and machinist I've found that all that experience helps a lot with my quilting..........well except for one fact, that I know, but forget to take into account sometimes. Unlike wood or metal........Fabric stretches! So far, all of my projects have been small wall hangings, so this new knowledge should save some grief down the road as my projects get bigger. OK, now that I've got that clear in my head, a question has popped into my head. Binding. Binding seems just like another border, with the same inherent problems discussed in this thread. But in the videos I've watched about binding, it is just sewed on, starting somewhere along one side and sewing around the quilt. Wouldn't doing it that way subject it to the same bunching problems that have been discussed here about borders? PS: In the opening picture in the article, is she using her sewing machine backwards? No problems with binding..imo it's because we leave "tails" when we start and end the binding. That's how I join my ends when binding. Binding seems just like another border, with the same inherent problems discussed in this thread. But in the videos I've watched about binding, it is just sewed on, starting somewhere along one side and sewing around the quilt. Wouldn't doing it that way subject it to the same bunching problems that have been discussed here about borders? For the most part, no, because binding is the last thing added to a quilt and is so narrow. Not much room to get in trouble with it. However, if you pull a little too much on the binding as you sew it on, you can get gathers. Been there, done that, we have jackets for that club. Kinda looks that way, doesn't it? The credit at the bottom of the photo says Getty Images, which tells me it's probably a stock photo and they used a set designer, photographer, model, editor, etc who all are unfamiliar with sewing & quilting. I'm just amazed they actually used a picture that is undergoing the process of the topic of conversation - binding. Usually they show a completely finished quilt. I may be mistaken, but I got the impression the OP was asking how to do a mitered corner with multiple borders when one sews all the border strips together and then attaches the border strip set to the quilt. If that is the case, here is a tutorial that might help.